New Zealand has reached a mature stage in the economic cycle. Historically, sharp slowdowns have followed such periods – but ANZ research does not believe the cycle is about to roll over and expire. Inflation is still low and credit-related excesses are being more actively curtailed. Cooling in some pockets (particularly housing) is welcome as it lessens the odds of imbalances building further and ultimately bringing about a nasty correction. Numerous support factors remain which should allow annual gross domestic product (GDP) growth to hover around 3 per cent over 2017. That is down from the 3.5 per cent to 4 per cent pace seen in mid-2016 but will still see unemployment and domestic inflation pressures slowly ease. Official interest rates are expected to rise although an uncertain global scene and the behaviour of banks (lifting retail rates) will allow the Reserve Bank of New Zealand to be patient. Any movement is likely to be gradual. Economic maturity is increasingly evident. Firms are reporting more issues with finding skilled staff and issues with capacity more generally. Productivity growth is waning – a typical late cycle phenomenon – and valuation excesses and leveraging behaviour is apparent. NZ has seen this all before, in 1996-97 and 2006-07, as sharp slowdowns followed a turn in the domestic cycle, exacerbated by major adverse global events. Is history set to repeat? We believe it isn’t, for a few reasons. NZ has seen a housing boom but not a broad-based consumption equivalent, helping to keep inflation low. Other factors are also suppressing inflation: technology, the global scene and the NZ dollar. Historically, aggressive lifts in inflation have necessitated the same for interest rates. Almost all lending is now regulated; NZ doesn’t have a shadow-banking sector. That helps keep risk more prudently priced and capital allocated more efficiently. Meanwhile, the RBNZ is not standing idly by. Lending restrictions are in and a review of banks’ capital is now underway. This combination could be a powerful influence over the coming years. Historically, New Zealand has seen large volatility through the economic cycle. International events have contributed but so has the build-up of internal imbalances and excesses. Purging processes have typically followed and this has exaggerated volatility across the economic (and interest rate and currency) cycle. New Zealand is headed into a period where the containment of excesses at the top will help limit the potential for corrections down the track. However, such a strategy isn’t without its costs or side effects; less credit availability will accentuate difficulties getting a supply side response to address housing shortages. Our forecast story is not just about growth through the economic cycle, it is about the volatility of that growth and potential risks around it. Economic signals are naturally becoming more fractured as late-cycle excesses are managed. This mixed dataflow is a theme we expect to continue to evolve over the course of 2017. But a cooling in growth momentum will help ensure the economy matures gracefully, as opposed to going out with a bang. The usual focal points require close attention. These include household leverage, property valuations and inflation. 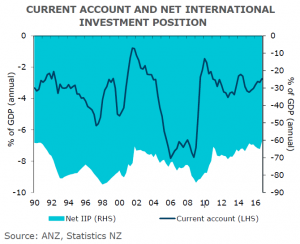 Encouragingly, external balance metrics, which would typically be a worry at this point of the cycle too, remain well contained, by New Zealand standards at least. The current account deficit of 2.7 per cent of GDP is below its historical average and net external debt is at its lowest levels since 2003. 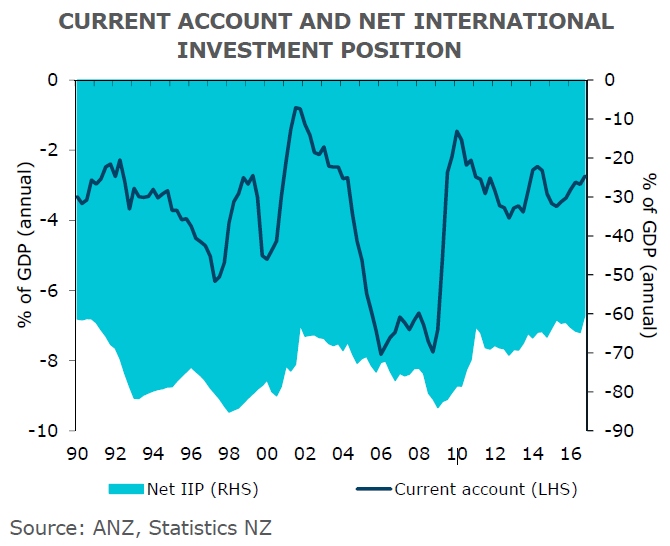 This doesn’t mean the economy is bullet proof and ANZ expects the current account deficit to widen modestly over the coming years, but it does mean the economy has more resilience to global or domestic shocks than would be the case otherwise. Fiscal policy is moving to a more neutral stance. The nucleus of an economy is the small things and there is no shortage of positive stories across NZ. There’s not space to list all of them here, but examples include the innovative stories we’re seeing across the agricultural space; the kick-starting of NZ-China free trade negotiations; the investment-style approach to social initiatives; and the cost efficiency drives from numerous business. Individually, these represent tweaks, but as a collective they create trends. Source ANZ Bluenotes. Cameron Bagrie is chief economist at ANZ NZ. Philip Borkin is a senior economist, David Croy is a senior rates strategist, Kyle Uerata is an economist, Con Williams is a rural economist and Sharon Zöllner is a senior economist at ANZ NZ.